Margaret will graduate Uhuru Academy in 2018. She lives with her six brothers and three sisters in Nema Resettlement Camp. Nema means ‘God’s Grace,’ and this is what the camp has been for the family after they escaped the post-election violence in 2008. 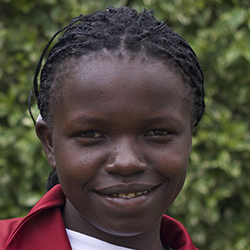 Her older sister, Gladys, is also a student at Uhuru Academy, and the sisters take good care of each other, making sure they are always doing their best. Margaret wants to be a lawyer when she grows up in order to fight for the rights of children and to help people who have been prosecuted unjustly. She is good at art and especially loves painting with watercolors. She loves that at Uhuru Academy, the teachers are polite and ready to help students. She says that without education you cannot do anything. Click here to sponsor a student like Margaret.